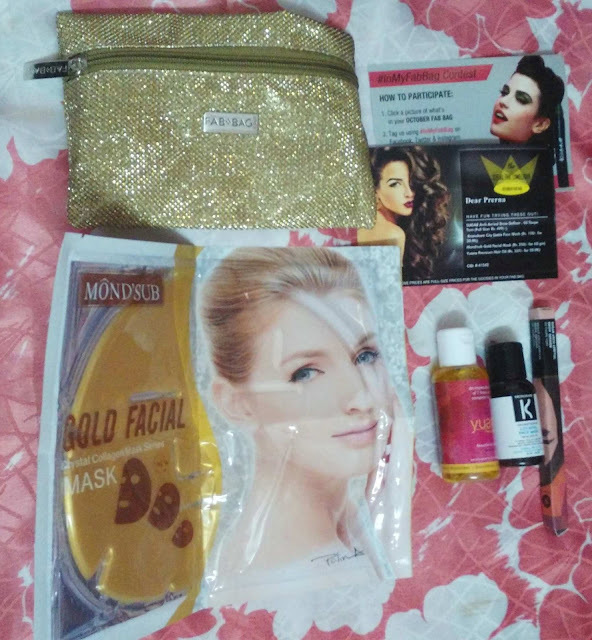 Hi friends I am back again with this October Month Fab Bag Review. The best thing about FAB BAG is that you get to try new products every month with amazing quality as per your skin type and skin shade. I am quite excited to share this Diwali festive season bag with you all since there are 4 products as usual but one being from one of my favorite brands Sugar Cosmetics and the other one looks very good to look at, that is collagen gold face mask. So without waiting anymore, let me start with this Fab Bag October 2017 Review. 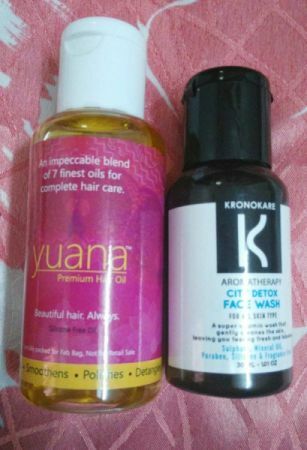 Kronokare City Detox Face Wash – Rs 150/- for 30 ml. 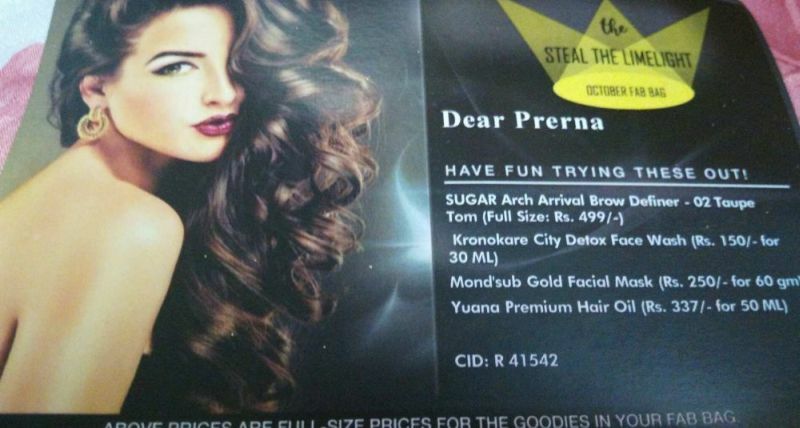 Mond’sub Gold Facial Mask – Rs 250/- for 60 g.
Yuana Premium Hair Oil – Rs 337/- for 50 ml. This Diwali October Fab Bag truly represents the shine, the sparkle, the golden festival with its super glossy golden glittery pouch. The bag is simple but surely focuses on the celebration time in its golden glittery color. There are 4 products this time with one unique and one new in the addition to fab products i.e Gold Collagen Facial, keeping in mind the festive season for that gold glowing look. Lets start with the products below. As mentioned before I was eagerly waiting for this sugar cosmetics bro definer this month and here it is in the shade 02 TAUPE TOM. As expected it looks very user-friendly with the duo function of filling the bros along with giving them a natural defined look. Very soon I will try this and update its before after swatches to show how it actually works. There are two shades in this medium brown and grey brown and opted for grey brown which is meant for fair skin beauties. Next comes this gold facial collagen mask. This Gold mask looks very different to look at showing droplets of liquid dazzling all over inside. The packaging itself tempts you to try the product. 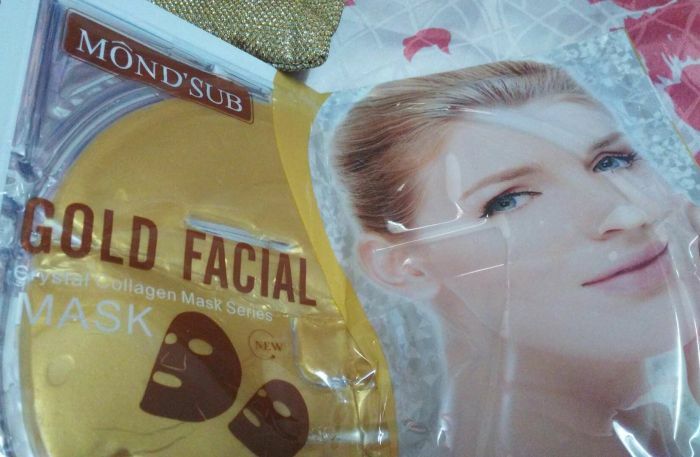 I am quite impressed with claims so will surely be trying this gold collagen facial mask for the first time on my sensitive skin before Diwali to revive my skin and have that flawless glowing skin. Next comes this Detox face wash from the brand Kronokare. I love receiving such tiny cute travel friendly bottles since these perfectly fit in your skin care bag making them easy to use and store. This super rich vitamin detox face wash looks quite interesting to try being paraben, silicone, sulphate and fragrance free, suitable even for the sensitive skin types. Last but not the least comes this premium hair oil, made of 7 finest oils to give you complete hair care. This oil not only claims to moisturize and nourish hair but also smoothens, polish, detangle and Boost your hair, which I think is very much required because shiny hair with glowing skin would truly add to the beauty of your Diwali. This was all about this month’s October Fab Bag 2017 and its amazing products. I hope you enjoyed the review and liked the products of the month. Be sure to subscribe for your own package of goodies from Fab Bag if you haven’t till now because these surely make your day when they arrive at your doorstep with the newly launched products every month. And off course have a wonderful and safe Diwali. Happy Diwali to you all.